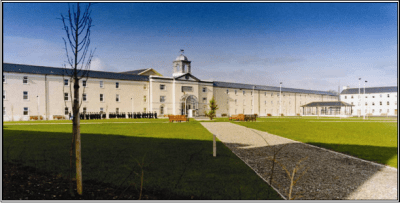 Garda College, Templemore – Duggan Brothers Ltd. This project at the Garda Training College included approx. 400 bedrooms largely in new three-storey blocks and also some in refurbished blocks, a new three storey education block incorporating lecture theatre, specialist training rooms, library etc, and a new physical education block including sports hall, new canteen & various other ancillary buildings total floor area 11,000m2. Residential and education blocks were generally constructed of pre-cast and in-situ concrete floors on loadbearing blockwork and also part concrete frame. Roofs were slated generally on steel and timber trusses. Walls were generally plastered internally and externally. External plastering was generally coloured plastered and dash panels. The education block has a glazed barrel vault roof over the circulation and staircase area and the project generally had some sizeable glazed areas. The entire project was carried out on a phased basis within an existing functioning facility without any disruption to the operation of same. As new blocks were completed and occupied existing blocks were then vacated and were either demolished to make room for further new blocks or refurbished.